Not well known to the general public, Maxthon has only a 0.30% share of the market for computer-based web browsers dominated by the Google ogre with Chrome. For the record, this program was first intended for the Chinese market before being offered in its version 2.0 internationally. 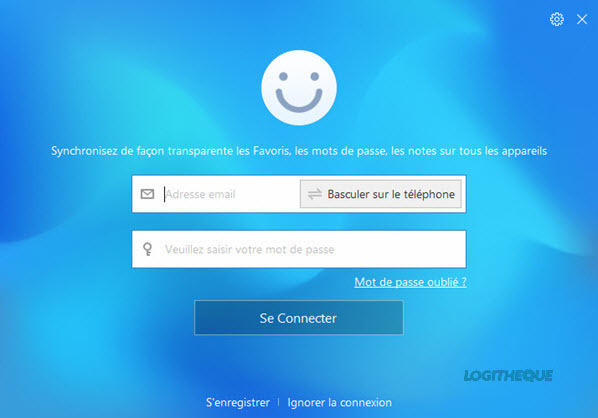 During installation, the browser will ask you for your phone number or email address to synchronize some of your navigation data, such as favorites, passwords and notes, on all devices on which you use Maxthon. The user has the option of refusing to enter this information by simply ignoring this step. The installation of Maxthon is very fast and takes only a few seconds. 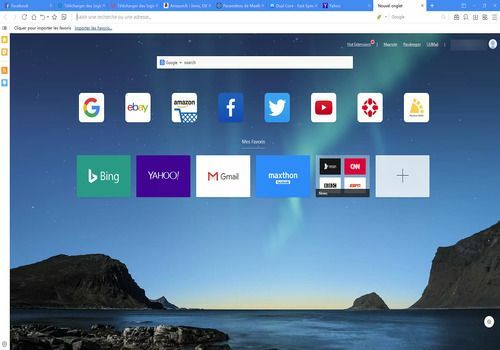 On its default homepage, the browser provides a search box that allows you to use different search engines (Google and Google Images, Bing, Yandex, Yahoo, etc.). In the center of the page, you will find favorites already set. These are links to popular services and sites. From this section, the user can easily view the sites and pages he visits most often and access the content of his last surfing sessions on the web. On this same page, you will also find an advertising insert at the bottom of the page. 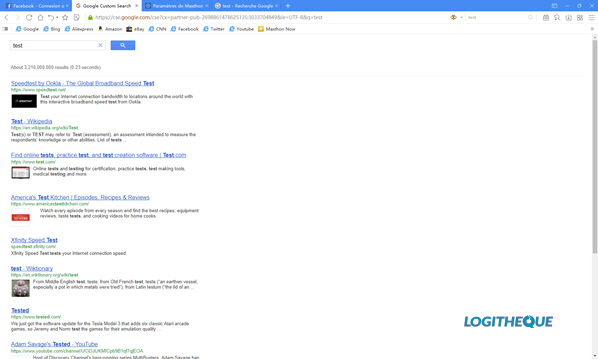 Ironically, the advertising content displayed at the time of the test was sent to a competing browser: Opera. If this ad bothers you, you can change Maxthon's homepage by going to the program settings at the top right of your screen. Moreover, navigating through the software settings is quite simple. The organization of the headings is similar to that of Firefox. The average user will benefit, as will the expert. On its left side, Maxthon displays a mini sidebar with tools: favorites, RSS feed reader, notes, etc. This bar can be disabled for more comfort. 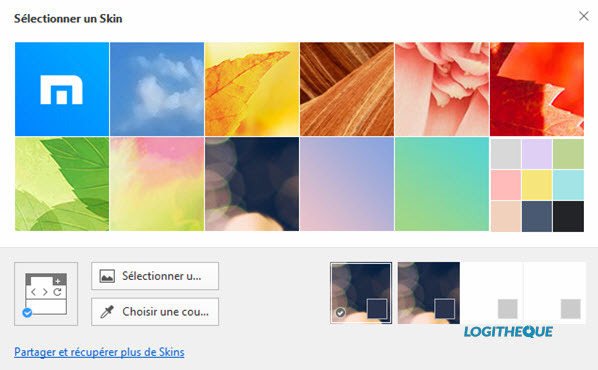 As far as customization is concerned, the program offers several themes that can be activated by going to Menu > Skins > Themes. It is even possible to create your own theme from an image or color. 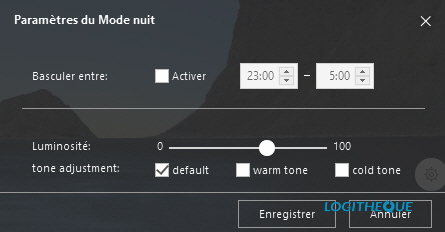 A night mode capable of being activated automatically is present. It allows you to adjust the brightness and warmth of the colors diffused in the software interface. What are the main features of Maxthon? As far as its main functionality, web browsing, is concerned, Maxthon is very good. The pages are displayed quickly and you will not feel any difference in terms of execution speed if you are used to using a web browsing tenor (Chrome, Firefox, Opera, etc). The same applies to the speed of launch and playback of multimedia content. However, remember to modify Maxthon's default search engine in its settings if you want to recover your habits and optimize your experience. Note that the browser can switch from one rendering engine to another with a single click. You can therefore choose between the Trident engine (Internet Explorer) or Webkit (Chrome and Safari). Overall, Maxthon is stable and resource-efficient. It is ideal for small configurations. Due to security reasons, the program does not include flash by default. You will need to install the corresponding plugin to view some videos. The browser differs from its competitors by its resource detector which will analyze the multimedia content of the pages you visit and offer you to download it. Even better, for some videos; the software is able to display them in a small detached window. Unfortunately, the program does not allow you to easily locate the video in question. Maxthon offers the "external tools" function which allows you to integrate shortcuts pointing to other software to launch them from the browser. The browser developer has also integrated the tools of his U+ suite into Maxthon: Maxnote, Passkeeper and UUmail. Maxnote: Maxnote is the note-taking tool integrated into Maxthon. Intuitive and rather complete, it is easily accessible and customizable. The tool includes a text editor and supports images and hyperlinks. Each note can be exported in the following formats: PDF, JPG, TXT, HTML and PNG. Maxnote also has its own screenshot module. This function also allows you to capture complete pages in JPG format, their textual content or only certain elements in HTML format. 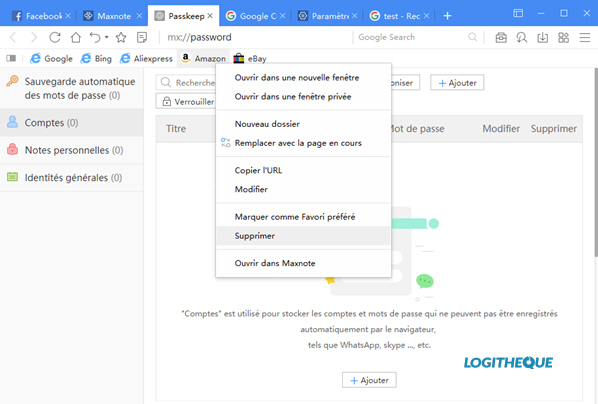 Passkeeper: This is Maxthon's password manager. It has its own password generator (on the mobile version) and displays security information (last recorded connections with IP address and device type). Passkeeper is easy to use and also allows you to save passwords that cannot be automatically saved by the browser. UUMail: a virtual mailbox service that provides you with a specific email address that can be used anywhere and allows you to filter spam. Maxthon also supports extensions. The browser extension catalogue is certainly less well provided than those of Firefox and Chrome, but there is still plenty to do. Is Maxthon a secure browser? The browser has a private browsing mode. Once this option is enabled, the software does not record a navigation history. However, files downloaded during private browsing sessions remain on the machine's hard disk. We submitted a list of misleading or malicious sites to Maxthon. 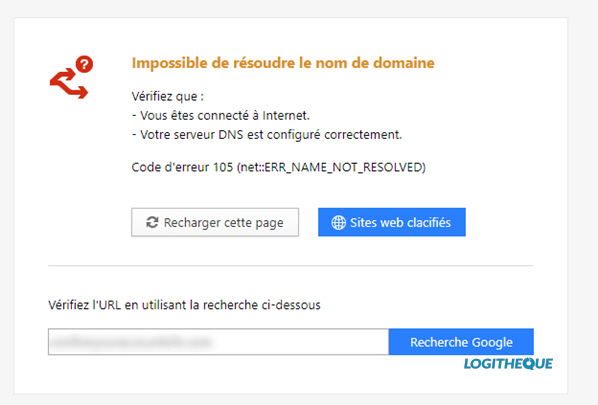 The program is able to block some sites, but does not specify the nature of the block, unlike other browsers that explain in detail why a given site is inaccessible. Many links fall between the meshes of the net. As for protection against abusive advertising content, Maxthon does not include a blocker. But the Ad-block extension is compatible with the browser, which nevertheless has a popup blocker enabled by default. Maxthon allows easy management of site access to a computer's microphone or webcam from its settings. It is also possible to block these accesses by default. Finally, the browser has an anti-tracking feature enabled by default as well as a cookie management module. Please note that Maxthon does not offer a VPN service. 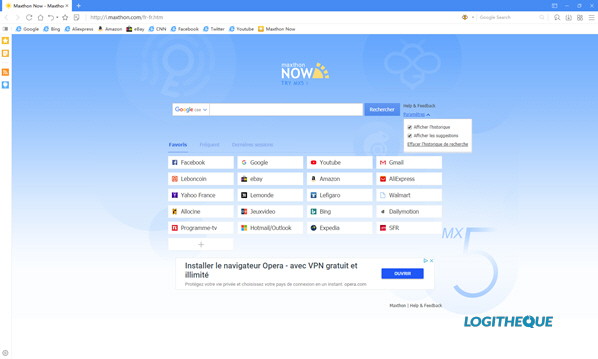 Maxthon remains a good browser despite flaws such as the presence of advertising on the main page or too many favorites already pre-configured. Fortunately, the software is quite customizable and allows to erase these slags. The average user should also be aware of the existence of these settings. As for its other features, we particularly appreciated the possibility of adding shortcuts to other software directly in the program. 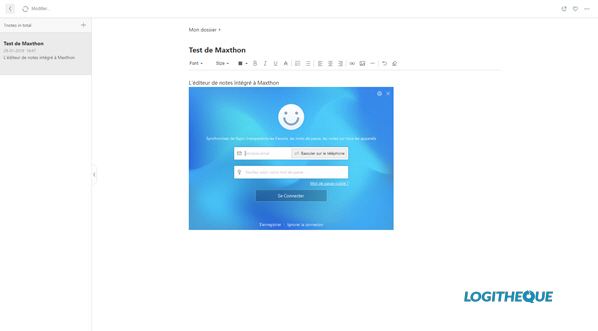 Maxthon clearly stands out with its note editor synchronized in the cloud thanks to the U+ suite. In fact, you can store up to 5 GB of data in U+ : a good point. Everything is in place to improve your productivity, but some security efforts are required.